Do you have Flash installed? Instead of trying to figure out this information, point your device to http://supportdetails.com/. This is a free online service that answers frequently requested items support people need. I’ve tested it with cell phones, tablets and various PCs. The service gathers these support details in a nonintrusive manner. It’s giving you back the information your web browser passes along to their web server. This is the same sort of data that webmasters or web analytics programs use. If you’re not familiar with what is captured, take a look the article we wrote on web server log fields for examples. You can also find more details at WhatsMyOS.com. About the only “gotcha” I’ve seen is for operating systems. On my desktop, it didn’t distinguish between 32 and 64 bit versions, but reported Windows 7. If you want to get really picky, it doesn’t translate my cell phone’s Android version to its food name. Thankfully, I’ve never had a tech support person ask me “are you running “ice cream sandwich” or “gingerbread”? The screen snap below shows the info from my Android cell phone. You can also export the system information as a CSV file or PDF. This CSV feature might be useful for support people or web developers if they need to track down common denominators from users who report problems. Below is an example I mailed from my iPad. 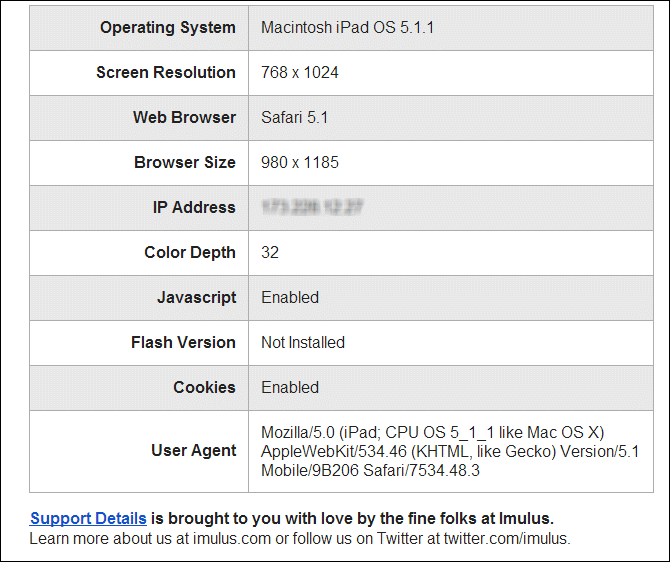 You can see it has correctly indicated that the iPad isn’t running Adobe Flash. Incidentally, this lack of Flash is why iPad users can’t see our older screencast tutorials. Another feature that you can do with the service is to append email addresses to the URL. This has the benefit of populating those fields which makes it easier for the sender and ensures accuracy. In the example below, the URL will fill in John Doe’s name, email and the recipient’s address. All I had to do was fill in the textboxes in the shaded green area and refresh my browser to get the new URL. I could now send a friend, relative or reader this type of URL to find out about their device. I could also use a URL shortener like bit.ly if I wanted to make it easier. Regardless of whether you need technical support or are offering help to others, Support Details offers an easy way to get answers and share info about your device.